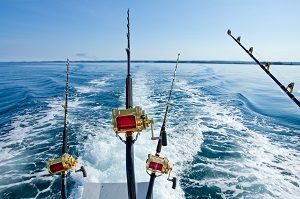 Are you thinking of booking a deep sea fishing charter while on vacation in Myrtle Beach? You don’t just have to try to find one that is expert and reputable, you also have to discover one that can fulfill your personal requirements. Hence, prior to your heading out to sea, you have to decide on what it is you actually desire from the journey. Your main concern should be, choosing the kind of experience you want to have. Is it deep sea fishing, out past the Gulf Stream? How about closer to shore? You may have an interest in booking a charter specifically trained on targeting particular species, like amber-jack, tiger fish or even shark? Elements like these would certainly depend upon the vessel, and the length of time you will be out. Next thing you should think about is the depth you wish to fish in. Charters vary between accommodating beginner fishermen and those created for experienced ones. Nonetheless, the terrific thing about this deep sea fishing charter boat in Myrtle Beach is, they have one for any type of level. 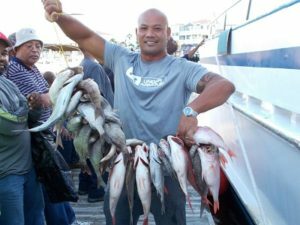 Some charters cater specifically in dealing with newbies and families, while some specialize in bringing more skilled anglers out to sea. Many charter services can, in fact, offer you numerous choices. Most likely, charter boat captains would provide fishing alternatives, which is helpful for novice anglers, families, as well as kids. For this situation, you should consider a 4- hour fishing trip, either in the early morning or the afternoon. Our 12-hour fishing trips take you out beyond the Gulf Stream and would be a better option, if you’re a skilled fisherman. A private charter would be best if you desire to have the boat to yourself, and fish with the best. New to the fleet in 2017 – 36′ Reel Work. 6 Passenger Sport Fishing Charter Boat with brand new electronics and Cummings turbo diesel engines. Fast, clean and modern with very clean restrooms. Need a recommendation? Just ask! Most likely the best suggestion, when searching for a charter, would be to speak directly with the captain, or the owner, to find out what is best for your situation. You would definitely not wish to be squandering cash and time on an adventure that is not really tailored for your requirements. 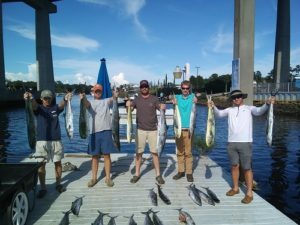 Most Myrtle Beach fishing charters are up-front regarding the various options, of length of time out, the number of vessels and type of service that they can offer. Thus, you have the capability to identify exactly what kind of charter would be the very best for you! After choosing the type of experience you desire, now it’s time to decide on just how much you want to spend for the journey. Basic, smaller boats with the capacity of 4-6 individuals have an approximate cost of $400+. If you wish to charter a larger boat for a whole excursion, rates will be much higher. For the best value choose a scheduled excursion and have fun with other vacationers. Lastly, you can directly interview your possible charter captains. This would help you see exactly what type of person you’ll be travelling with. Most of the time, this approach is the one that shows whether the charter service is reputable or not. Contact Voyager Deep Sea Fishing & Dolphin Cruises today, to book your 4-hour or 12-hour fishing trip today! This is our 2nd trip with this company. First was a dolphin cruise and it was awesome. Took my family on a half day deep sea fishing trip yesterday and that was nothing less than spectacular! Captain and crew member were awesome. The captain even came down and helped my daughter the entire trip so she could catch fish. They put us on the fish and they were super friendly. I recommend this to all for any dolphin or fishing event. Thanks for a great trip Voyager! We will be returning! We enjoyed our dolphin tour. It was something I wanted to fill out our time up with. We loved the tour. It might’ve been slow making it out to sea but they talk about the area which was nice. We was told by couple of people other dolphin tours would race out to sea. An my daughter is little Leary of boats so this was the best choice. An we saw more then dolphins, we saw different kinds of birds, and a guy wanted to show off his shark catch. So this tour is well worth the time and money. Good crew and service. Great staff and made it for an awesome time! We felt welcomed through it all. Yesterday, my mom and I took my 11 year old with Autism Spectrum Disorder on the Dolphin Cruise. We were so nervous being on a boat in the ocean for 2.5 hours with him since meltdowns can occur at anytime for unknown reasons. He is nonverbal, has many sensory needs and has spatial awareness issues. The entire staff was so kind and accommodating to us, I had happy tears. Thank you to the men that let him sit with them while waiting to board! Thank you to the lady that adjusted to him while taking pictures before boarding and holding our picture until we finally made it off the boat! Thank you to the boat crew for talking to him and letting him see the captain’s room when not so crowded! Thank you to men that got my son down from the top of the boat! (The steps were to steep and he was extremely anxious). The kindness and compassion that the entire staff had for us was above and beyond! You showed us true southern hospitality! paul is the best. always there when you need him! made the best fishing trip ever ! Went fishing with my 2 year old daughter and 66 year old aunt and we all enjoyed the adventure! I brought a portable dvd player for once we started fishing for my daughter. There’s a bathroom on the boat which was Great for my “wee one”. They had cold beverages on board for purchase, tables inside (out of the sun), and an upstairs which was nice to feel a breeze. We enjoyed it so much, we went on a dolphin tour the next day! My “wee one” didn’t start out so great on this trip and one of the crew members brought her a frozen popsicle to help out. Very nice and friendly crew!!! Thanks Captain Brian and Awesome Crew!!! We had a party of 8 (two 8 year old kids, 2 teenage boys and 4 adults.) we signed up for Shark night fishing. Captain was very honest that with the hot weather the fishing was sketchy. It didn’t matter- although we would’ve loved to had caught sharks, we had a great time! The crew was extremely polite, friendly and helpful as was the captain. They really made the trip fun! Thank you! We had a great time! My husband & I went out today on the Continental Shelf. Our crew members, Josh & Brian were great! Between the two of us, we probably caught a total of 20 fish, although none were big enough to keep. Ii loved the dolphin cruise. Capt. Brian Davis was a delight in his narrarating the tour. The ride in ththe ocean was great. We did indeed see dolphins and the crew was friendly and caring that everyone was a having a great time. Would highly recommend it!! Amazing. Very clean. Food on boat for purchase. Crackers, chips and drinks for $1-2, also burgers for more. Bathrooms are very clean. Crew was very helpful and nice. Did the 1/2 fishing trip (5 hours) and it took about an hour to get out to the general fishing area. Fished for about 3 hours moving around from area to area and then another hour to get back. Caught a shark and the crew cleaned and bagged it. Out of the 4 different companies I have fished with around the Myrtle Beach area, this was by far the best. Their head boat was perfect for my 3 young children and wife, who do not like to sit in the sun for hours at a time. Very spacious, decent fishing, and a nice covered area in the middle of the boat to relax in the cool shade. Would recommend this place to anyone. If you want to experience being out on the ocean it’s a great trip to take. The dolphin views just top it off. You get to see a lot of great things on your way out as well. The captain of the boat is very well trained and knowledgeable. The crew is all very nice and the food on the boat is cooked in front of you well priced and delicious as well. 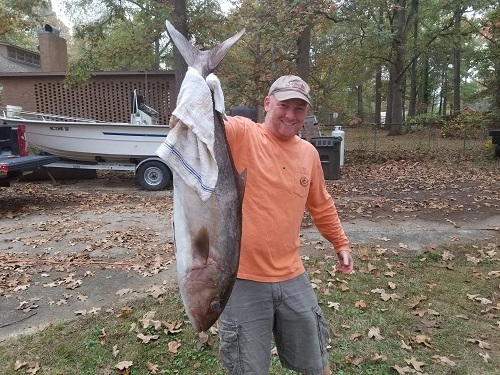 I’m from Ohio and I chose this fishing trip because it was a great price! We got there and got on the boat and we took off shortly after the captain was very informative about where we are going how the ride is going to be. I actually ended up getting seasick and the first mate was taking care of me making sure I was feeling better and gave me free pop and chips. then after I started feeling better I started fishing and I was fishing next to the captain he was taking all the fish off my hook for me. We moved 3 times and each time we moved we caught fish! Then they cleaned and bagged are fish for us and didn’t even charge us! I saw the reviews about people saying he was rude and yelled I don’t know what they were talking about because my experience was completely different and very awesome. We will definitely go on this trip again!! Our family did the sunset dolphin cruise last night and we would all rate our experience a 5-star. Jerry and Sandy…the crew were excellent. Jerry even called Captain Kevin on the radio to have him turn the boat so the dolphins were on our side of the boat and he helped mom stand at the railing so she could see them up close. Speaking of dolphins ..Captain Kevin found us a pod of at least 20 that were very active and had the excitement level of the group at a peak. The tour was great….the crew was amazing and made it super fun. There is a fairly steep ramp and wooden planks to and from the boat and the crew made sure mom made it safely both ways. We couldn’t have asked for anything more. Took the wife and kids out on a charter boat with Cpt. Justin and his deck hand Oscar at the begining of August. Man we had a blast. The Cpt. kept us on the fish and Oscar was taking care of business. We pulled in a ton of fish (not all keepers) but enough keepers to make it well worth the while and the money. The wife even pulled in a shark. Oscar got it in the boat after she reeled it in and handled it like a pro. The kids reeled some in and had a blast. Everyone was super friendly, helpful and made it a good experience. Would definitely charter with these guys in a heart beat! What a fantastic trip. I have fished head boats up and down the Atlantic and the Gulf. The crew (Josh and Paul) were great. I took my whole family out for the first time and a great time was had by all. My girls, 7 and 9, were doted on by both guys and they took the time to show my son 14 how to fix a backlash. We didn’t catch a lot of fish, but that wasn’t due to a lack of effort by the captain and crew. I would HIGHLY recommend the half-day for any family looking for a first time experience. This trip is awesome. 2nd time I have been out on this fishing trip. Captain and Mates are topnotch. Captain puts you on fish every time. Caught our limit of Vermillion Snapper in 1st 3 hours then it was on to Jacks, Blues and Bonitas. What a great time. Only down side to the trip was the boat was crowded. If you did not know how to bottom fish the line tangles were constant. I will be back! Thanks Voyager Fishing Charters for a great fishing trip. First chance to get back to sea fishing in a long time and the operation was amazing. Although we only caught one fish (our skill?) the ride out was like a tour in itself. The business is run by ‘old school’ style ethics, you get much more than you pay for. The crew worked the butts off and we tipped. 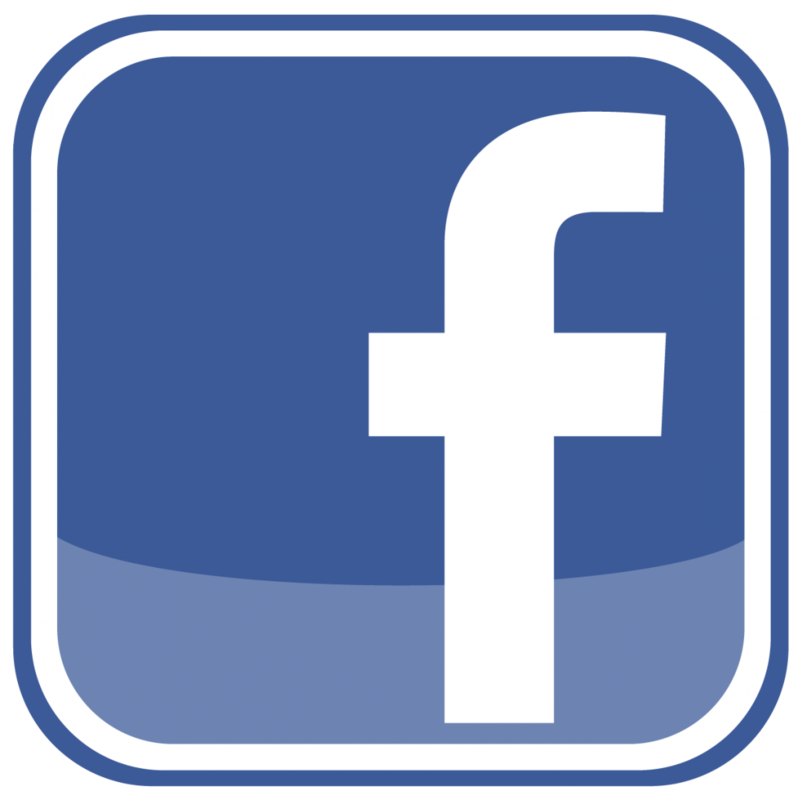 Check out our reviews online. 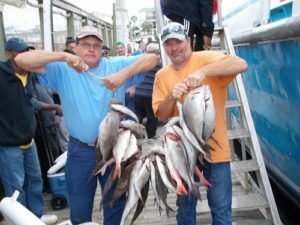 Of course, some reviews are less than what we would like, so please, if you have any problem with our deep sea fishing trips in Myrtle Beach let us know right away. Our goal is for you to have the time of your life whether you are a visitor to Myrtle Beach or a local. Deep sea fishing is an interesting and also gratifying leisure activity. The most effective thing is that it is similarly enjoyable both for family trips as well as for group adventure. The most effective method to discover fishing in a deep sea is by taking guided instructions under knowledgeable fishermen. The majority of the very best fishermen today have known the methods of this trade through years of experience. Nevertheless, if you could not locate a knowledgeable individual, you could still find out the fundamentals of deep sea fishing through companies who let you experience such adventure such as Voyager Deep Sea Fishing & Dolphin Cruises. The internet is also an outstanding source of details and reading this short article is an excellent way. Below to are a few of the important things one needs for efficiently capturing fish from the big sea. 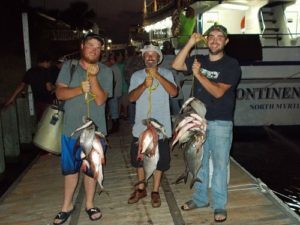 For a group of people, employing a charter solution is one of the most practical and also budget-friendly means to participate in deep sea fishing adventure. It is particularly beneficial for novices. The crew members in most of the charters, such as in Voyager Deep Sea Fishing & Dolphin Cruises, recognize the areas where fish are readily available. They could assist in discovering appropriate baits and even provide ideas about fishing strategies. There is a very little distinction in the kind of devices needed for deep sea fishing compared to freshwater fishing. Nonetheless, the nature of devices does change, as the fish in the seas are a lot larger as well as more powerful compared to those discovered in fresh waters. Poles need to be bigger and also tougher compared to those made use of for freshwater fishing. Poles of differing sizes are offered. One needs to pick an appropriate pole based upon one’s demands. Reels come in different types. They are readily available nowadays with all type of specifications. For newbies, the most effective alternative is to buy a basic no-frills reel and also find out the method of deep sea fishing initially. One could choose innovative reels when one becomes comfortable as well as positive in capturing fish. Belt, as well as a harness, offer far better alternatives for the fishermen to regulate the poles. They additionally make the procedure of bringing up the catch less complicated. One could locate a selection of lured provided. Novices need to try to obtain lures of various shades. One must have the ability to match the shade of the lure keeping that of the bait. Several skilled fishermen state that baits are one of the most crucial points in obtaining the type of fish one is trying to find. One might obtain the very best tools readily available; nonetheless, if the fish does not like the lure, they will certainly not come close by it. Basically, a badly selected and severely preserved bait is most likely to ruin the journey. There are no set regulations in choosing appropriate baits for deep sea fishing. 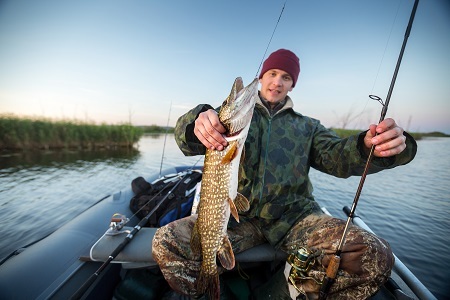 One should initially recognize the sort of fish readily available on a certain area then choose baits based on that. One must do some research study concerning the preferred food of the fish based on location. For more information on deep sea fishing, you can call or visit Voyager Deep Sea Fishing & Dolphin Cruises in North Myrtle Beach. When you are venturing deep at sea for fun, comfort and safety should be your key priorities. Here you are sure to find fishing boats with all the amenities you would expect in a luxury boat. However, it is always important to do some little background research on the best deep sea charter companies to ensure you enjoy the best services. Although fishing near the pier is fun, it can really be a turn off if you cannot get ample space as a result of overcrowding. Deep sea fishing provides the space and the serenity to angle freely as much as you like. Furthermore, it gives you a perfect opportunity to bond with friends who share your passion for deep sea fishing. The fun with any form of adventure is that you never know what sorts of surprises and new experiences are in store for you. If you are a professional angler, you probably know very well that fishing near the shore has its limitations. This is because some fish species like to play deep and you will rarely get any along the shorelines. Delving deeper gives you the opportunity to come to shore with rare and huge trophies to show off to friends. If you want to go a little overboard, you have to be ready to dance with the big boys. If you stay close to the shore, you will never learn new fishing skills. For instance, angling along the shores is much easier because the waves are gentle and the wind calm. Fishing is a fun experience, but the fun can soon turn into a boring routine if you are not ready to take on new challenges. 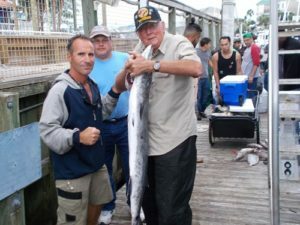 If you are the kind of person who is sensitive to weather extremes, then charter deep sea fishing in Myrtle Beach provides a favorable alternative. Apart from enjoying the comforts of the charter fishing boats, the warm weather provides a perfect condition for anyone to engage in fun fishing. During the fall, the weather in this amazing location gets better. You can delve deeper into the sea without worrying about violent storms or extreme weather conditions. If you plan on going deep sea fishing this fall, then Myrtle Beach is the perfect location for you. For real fun, you should try out charter deep sea fishing boats which offer high-end services with all the amenities of comfort you would expect in a luxury boat. We went out 10/21. Very choppy seas, but had a neat experience. My husband got sick even after dramamine, guess he needs super strength! Even still, he had a good time. Everyone was great. My son even caught a little black bass. We’ll be back! Thanks again for trip out on the ocean. Staff was great, we didn’t catch anything but right after the hurricane we expected it. Waves were rough, but captain did a great job! Well ran staff, and kept us informed. Got rain checks for another date. Can’t wait to try again! My family and I had an amazing time today! The crew was awesome! Very helpful and taught us all some stuff! Would definitely do it again! I caught two fish, at once! It was great! 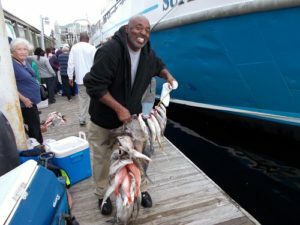 Deep sea fishing in Myrtle Beach is one remarkable experience you can enjoy with family and friends. Nevertheless, it is a task that is frequently not taken full advantage of. Majority of people have no idea that there is so much more to deep-sea angling compared to simply fishing itself. It is now time that more people get to enjoy this type of sea adventure. 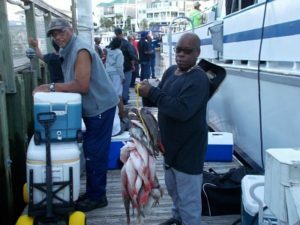 If you plan to spend a holiday with your family and friends, why not go deep sea fishing in Myrtle Beach. Here are a few tips so you can have the best time in this wonderful sea adventure. During a full moon, crabs normally got rid of their skins. So if you’ll be deep sea fishing on a full moon, you can attempt using soft crab as your lure. Doing this would certainly tempt the other fishes from their hiding positions to go watch out for the crabs. If you’ll be spying for tuna, specifically yellowfins, one excellent way to find them is stay where the dolphins are. Tuna is usually group with dolphins. So when you spot dolphins, there is a higher chance of spotting tunas as well. Nevertheless, it is essential to remember that you should take care not to land at a dolphin also by mishap since dolphins are shielded species which must be treated with caution. 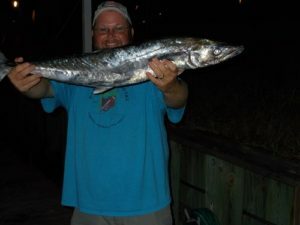 Going solo in any kind of activity is not that enjoyable just like with Myrtle Beach deep sea fishing. So, if you truly intend to create something from your journey, such as valuable memories and then it is time to call in friends and family to share the adventure. If you suffer from sea sickness or nausea, you might find it hard to enjoy deep sea fishing. However, if you really want to experience this type of sea adventure, don’t let this hinder you from doing so. You can take the necessary precaution before going on the sea adventure or try looking at the horizon. Sometimes, it is just a matter of over thinking it so might as well fight it. Voyager Deep Sea Fishing & Dolphin Cruises offers Gulf Stream fishing, private boat charters, and dolphin trips. You can call now or go online for reservation.